User 42: This panic is raised by a number of RHeap member functions, AllocLen(), Free(), FreeZ(), ReAlloc(), ReAllocL(), Adjust() and AdjustL() when a pointer passed to these functions does not point to a valid cell. 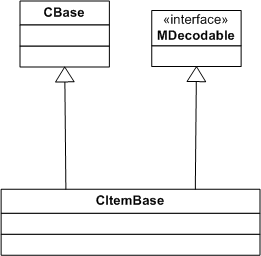 Ignoring the fact that a function called ReadItemLC() should return a CItemBase*, not an MDecodable*, the problem here is that in that inheritance hierarchy, both CItemBase and MDecodable have their own data (MDecodable has a vtable pointer, even though it's an abstract class). Consequently when you cast a pointer from an MDecodable* to a CItemBase* you get a different pointer value. Try the attached code on any system for a demonstration of the problem. However, in the code sample above, the CItemBase class had not been fully defined; we had simply forwarded-declared CItemBase. That meant the compiler couldn't do the necessary arithmetic (subtract 4) to convert an MDecodable* to a CItemBase* - because it didn't know whether they were actually part of the same inheritance tree, or completely dissociated types. So it did the equivalent of a reinterpret_cast. at the top of the file fixed the compile - and fixed my User 42 Panic as well. Lesson: next time I get code from another source, check the casting is done properly.